London-based Bonhams Fine Jewelry sold a fancy 5.3 carat blue diamond for a record price of $9.5 million — that's $1.8 million per carat. The previous world record for a blue diamond was $1.68 million per carat. An international diamond house in London — Graff Diamonds — bought the rare gem at an auction last week. 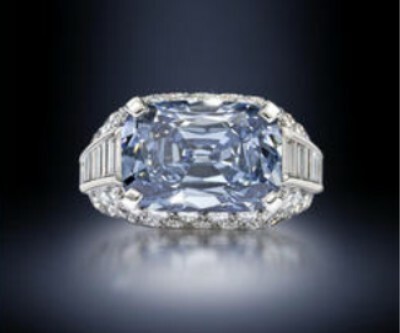 Bonhams had estimated the gem would sell for between $1.5 million to $2.4 million. The fancy deep-blue gemstone is set in a 'Trombino' ring made by Italian jeweller Bulgari around 1965. Bonhams said blue diamonds, especially those more than 5 carats, are extremely rare to see on the market and continue to be highly prized amongst buyers.